Like many other coaches, Antonio Mantero has very strong beliefs regarding youth football and where his country's culture is lacking. What distinguishes him from many others, however, is the fact that he is doing something about it. 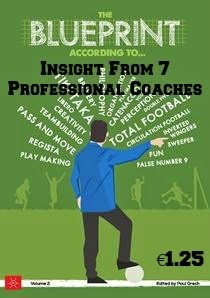 Through his site The Coach Diary he puts out (or links to) articles that outline his ideas and he's now also organising talks about youth development. Blueprint for Football: Let's start with the basics: what got you into coaching and how long was that? Antonio Mantero: My nephew was playing with Bohemians and I was introduced to the Academy Director, he had mentioned that the u12s were looking for an assistant and asked would I be interested. Without really thinking about it I decided to help out. In the very first week, the manager decided to leave the team which left me on my own. So to say my very first season coaching football was difficult, is an understatement. I was coaching and managing with zero experience and that experience lead me to where I am today. BfF: What project are you working on at the moment? AM: Via my blog, I will continue to express my feelings on how the game in Ireland is not age specific and how the FAI and the league administrators could be doing so much more for the development of kids in this country. Many coaches in Ireland are adopting the change but nearly all the schoolboy leagues around Ireland continue to be years behind where they should be. On Monday March 25th, I organised a talk about the Future of Youth Development in Irish Football, which was the first of such talks, which are completely free for anyone to attend. The emphasis will be on youth development and changing the structure of the leagues around Ireland. AM: I’ve read many books and come across many coaching philosophies and now I have come up with my own. My philosophy teaches success is many different ways, getting a group of kids to play together, as a team, play to their very best, and reach their ultimate potential while having fun. I want every player to enjoy their experience as part of the team; everyone on the team is expected to put the best interest of the team first, before any thought is given to individual accomplishments. I read a lot of Horst Wein books and use his Guided Discovery way of teaching, a teaching model where students learn through explorations, but with directions from the coach. I expect my players to give 100% in training and play as if they would on a Saturday, I do everything with the ball and use a a lot of possession games. 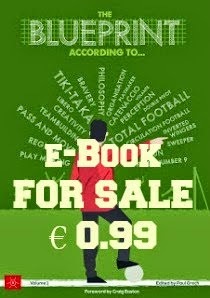 I’m reading a book by Jesus Enrique Gutierrez Mayor, (Former Real Madrid Coach) ‘Possession: Play football The Spanish Way’ a collection of some brilliant possession games. I believe ”Perfect practice makes perfect”, players should properly practice the skills being taught on a repetitive basis, so that these skills become as natural as walking and talking. I always strive to make my session an enjoyable experience that both develop skills, game intelligence and provide positive life long memories for every player involved. Playing football should be FUN. I love football and I want the kids to play with a smile. I try to instill in every player, that hard work pays off and the harder players work, the more they will achieve. While being successful is a goal for everyone, at the same time each player should focus on effort – not outcome. A team can always control effort but seldom the outcome of a game. I expect my players to set goals for themselves and the team. Goals should be challenging enough to require players to extend beyond their present skill level. Every player should have the chance to achieve success and/or failure in game situations, this is the only way they can learn. When they do things right, I’ll give them positive feedback. When they make mistakes I’ll give them feedback in terms of advice or instruction, but always looking for the positives from every outcome and always guided by what they think and say. I coach to keep kids in sport for life; this is my ultimate goal. AM: I love to win just as much as anyone else, when I play a 5v5 with my mates I go out to win; with the kids is different, when a coach or a parent wants to win more then the kids themselves therein lies what is wrong with the game in this country. I use to be one of these people, but i have educated myself on how to coach kids. Winning is not important, playing the right way is! If a player has given his all and lost, he is a winner anyway. For me winning is as important as losing. Success and individual growth have much in common. it's known that successful coaches are often remembered by former players more for their lessons of life than for winning or losing. Good coaches know that the key to success is motivating their players to do their best and improve beyond apparent limitations, motivated by team goals. The best coaches know that spirit, the will to win and to excel are important things that are more important than the game itself. A really good saying to remember..... "You never exceed your own expectations"
BfF: What do you prefer: a talented player who doesn't value work or a hard-working but not as talented player? AM: As football is a team sport, I much prefer a player who never gives less then 100% and doesn't caress the ball too much. People say hard work comes from within, which is true but you can also inspire players to work harder for the team through mindset and by making sure your training session are of a high tempo and switching players from defending to attacking in possession games, giving the teams various rules of play and setting targets against each other. This way you can see who is working hard and who is not. I tell all my players never to give up and if you lose the ball, go and win in back. Their are some great individual players on our team, but one thing is for sure, they're a TEAM. . I love this quote "Hard Work Beats Talent, When Talent Does Not Work Hard"
BfF: If you could change one thing about football in your country, what would that be? AM: I would keep kids playing Small sided games for much longer and the move to the adults 11v11 game at u14s. We don't get enough time with our players compared to the rest of Europe, so our players don't get enough touches of the ball. You said one, but I'll give you two; the second thing would be, no competitive leagues until u13s. The Blueprint According To... is a monthly feature looking at youth football coaches and the philosophies that drive them. Read more on the Blueprint for Football Extra.